Before you say anything, this fruitcake is DELICIOUS. It's nothing like the dreaded holiday variety, but rather a moist, chewy, nutty, dense loaf with hints of citrus. Once again I have my mother to thank for this, as she scours all resources to find sugar-free, wheat-free treats to bake me! This one is from the sugar-free desserts collection of AllRecipes.com. In a medium bowl, mix stevia with orange juice and stir in chopped cranberries. Soak 1 hour, mixing often. In a large bowl, mix raisins, nuts, coconut and lemon zest in the flour until well coated. Add cranberries and orange juice mixture. Sprinkle baking soda over mixture, and mix. Stir in spices. Fold in crushed pineapple. Pour batter into a greased and floured 9 inch loaf pan. Bake at 325 F for 40-45 minutes. Cool. Makes 1 loaf. Pictured above using spelt flour and dusted with icing sugar (optional). I LOVE fruitcake too. Sad how such a wonderful treat has been vilified here in North America - I blame it on those synthetic cherries and the media. ;) Thank you for sharing this sugarless recipe. I'm completely off sugar right now, and most holiday treats are packed with it. Happy healthy baking! This actually sounds like an edible alternative to those perfumery fruitcakes that keep getting passed around. This one would be a keeper! when you mention flaked coconut are you referring to the usual sweetened kind? Sharon, yes Stevia is usually a bit of a pain to work with, especially in baking. But in this case it actually worked out well! Possibly because of all the dried fruits to temper it? 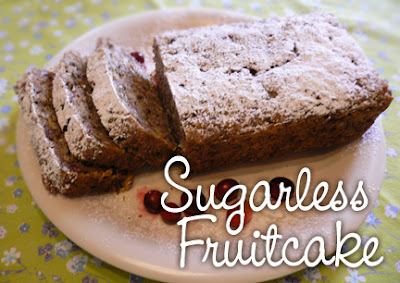 I've never had fruitcake, and I love that yours is sugar-free. My acupuncturist wants me to eat more poached or soaked fruits, so this is perfect. Thanks for the inspiration! I am planning to make this cake for a friend who's allergic to wheat and sugar. I have a question. Did you use fresh cranberries or dried ones? Thanks. Great idea to make this cake for your friend! We used dried cranberries, which is why they soak in the orange juice, to make them soft. If your friend can't have sugar, make sure you are buying UNSWEETENED cranberries, as most are sweetened to take the bite out of the sourness. If you can't find unsweetened dried cranberries, you can also try dried cherries. If neither are available, try canned cranberries (in water or juice, not in syrup) and use 1 & 1/3 cup drained cranberries and leave out the orange juice. Have I read the recipe correctly - is it 1/4 cup of lemon rind? Often recipes only call for a teaspoon.